Are You Eating What You’re Telling Your Kids to Eat? I’ve never been much of a fruit eater. As a kid, I don’t remember a whole lot of fruit making it to the table. Don’t get me wrong, we ate our fair share of well-balanced meals with vegetables and the like, and I’m sure fruit was in there somewhere, but we were also the family in the 70s and 80s who had Pop-Tarts for breakfast and huge cans of Charles Chips delivered to our door. No one was exactly clamoring for fruit. Fast-forward to adulthood where I have been known to enjoy a really good strawberry or orange and some other fruity things now and then, but if I had my choice, I’d take a salad any day. And my kids, who are pretty good veggie eaters as far as kids go, well, not so much with the fruit either. Oh, I’ve tried. In baked goods, on sticks, in fresh and dried form, and dipped in chocolate and powdered sugar. They tolerate it, at best, but definitely aren’t gobbling it up as a snack or an after-dinner “treat.” I’m always bewildered by the kid I see in the preschool class or lunchroom, munching on his sliced apples or grape bunch without the slightest nudge from an adult. It’s become kind of a joke. Me, the health-minded foodie, has a couple of non-fruit eaters. I used to put fruit out on the table at mealtime, and talk up its deliciousness like it was a Barefoot Contessa double fudge chocolate-chip brownie. When that didn’t work, I pulled the nutrition card, with a lesson on the food pyramid and the energy crisis that will surely attack their growing little bodies if they don’t get their daily servings. But alas, another fruitless day. I guess it’s no big surprise — if truth be told, I haven’t set much of an example. (My husband must share some of the blame. Though I’ve never heard him ask for or suggest it, he ranks just slightly higher on the fruit intake). I do have better weeks than others, but more often, I buy the stuff, it sits on the counter, grows spotty by the day and, sadly, gets tossed. In other words, I knew I wasn’t walking the walk. 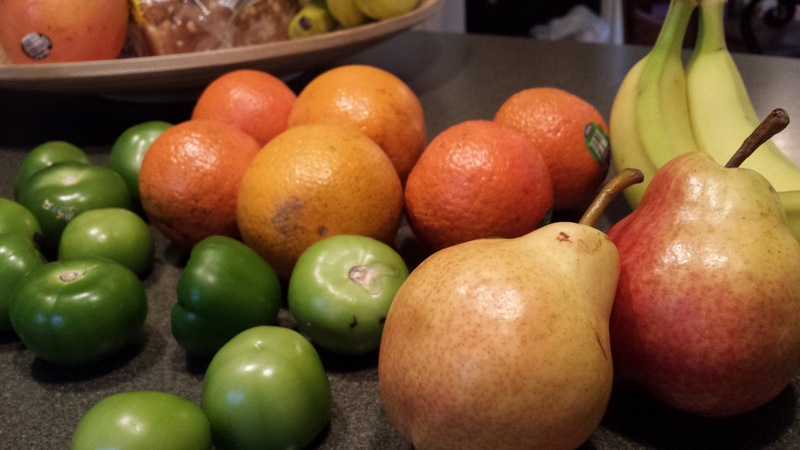 How could I expect good fruit eating from my offspring when I wasn’t doing it myself? Recently, though (at the risk of jinxing myself), that’s all started to change. It could be that my general persistence is just beginning to make some headway in the house, but more likely, it’s the fact that I’m not only eating fruit in front of the kids, I’m really loving it. 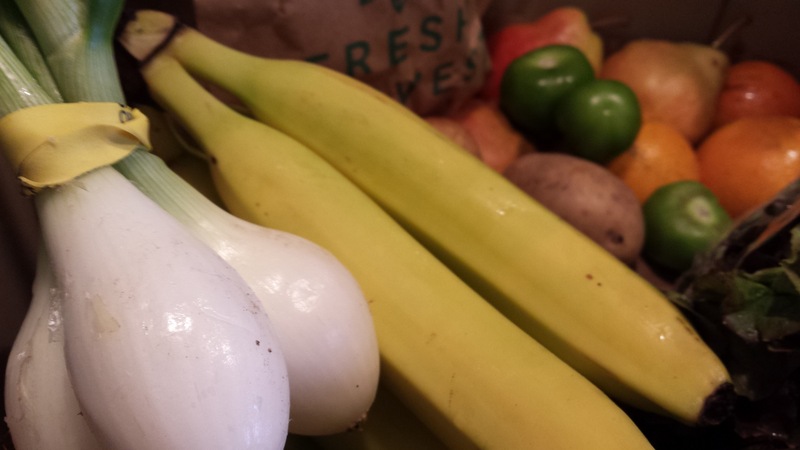 I’ve said it before, and you’ll probably hear it again in this blog, our local produce delivery service has changed the way we eat. 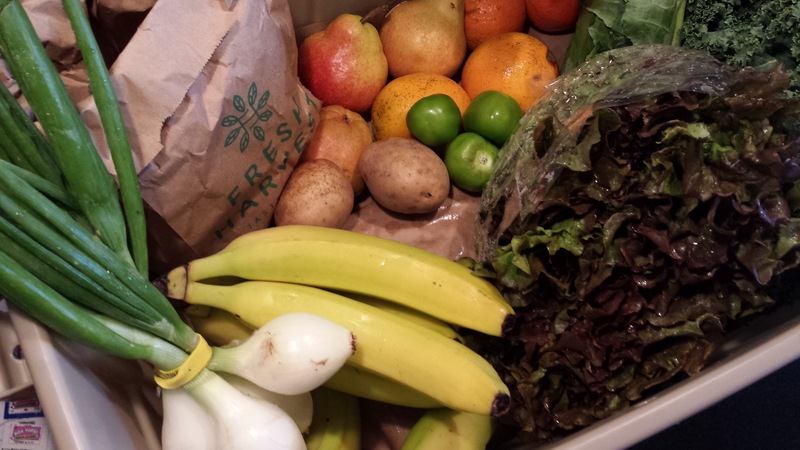 Fresh Harvest, a little company in Clarkston, GA, partners with local, organic farmers to deliver fresh, seasonal fruits and veggies (some common, some I’ve never heard of) right to our door. These are like nothing I’ve ever gotten at a grocery store. Ever. They are just richer, deeper in flavor, as fresh as it gets. And because their stock is always changing, it forces us to try new things and be creative in the kitchen. Now, it’s not unusual that my husband and I will dig into a grapefruit with noises like “mmmmmm, soooooo good,” or say something like, “Honey, you HAVE to try these strawberries. OMG!” I think the kids got curious. Just the other day, Riley reluctantly tried a piece of my grapefruit and then asked for four more bites. And Roman is eating apples pretty regularly (with honey mind you, but still). We may not have turned the fruit corner just yet, but there is hope and a good reminder about “doing as I do” with kids who are always watching. Just the other day, Riley, whose class is discussing healthy eating, told me that sugar is really, REALLY not good for you. Yes, I said, sugar is definitely something you want to eat in moderation. “But Mom, she said, you put sugar in your coffee every day.” Yep, they’re paying attention.